Afternoon tea and cakes will be served. Not bad for a girl from Antigonish! Clare Bridge’s initial collaboration of art and nature was shaped by her Quaker education in New York. Early on she developed a keen understanding of the simplicity of form and design. In college, majoring in fine art, she was initially drawn to painting with acrylics. However after moving to Maine in 1973, her desire to express strong colours and textures led her to mixed media, incorporating glass, metal and recycled elements. Clare incorporated organic tones of her mixed media discipline into jewellery designs. And so evolved her “wearable sculptures” inspired by her now Nova Scotia home with its profusion of organic coastal offerings. Dorothée was born in Germany and immigrated to Canada in 1989 at the age of 19. In 2005, she graduated from NSCAD University with a major in jewellery design and metalsmithing, and a minor in art history (focus craft). Recipient of various awards and scholarships, Dorothée showed outstanding achievements in her studies at NSCAD, and continues to participate in exhibitions in Canada and the US. Dorothée creates in her studio in Halifax. Her work is available at her studio, or through several galleries in North America. We are so proud to introduce the arrival of Manitobah Mukluks designed by the Canadian Metis. Through this company they continue a tradition dating back to the early 1600’s when the North American fur trade spawned the birth of a new people called the Metis. 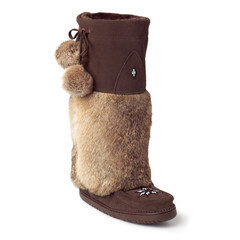 Throughout history Canada’s first peoples wore mukluks and moccasins made from the hides of the animals that sustained them. When the Europeans arrived the Metis taught them how to survive in the harsh winters and kept them alive with their traditions including their garments and footwear. The story continues . Have a look. 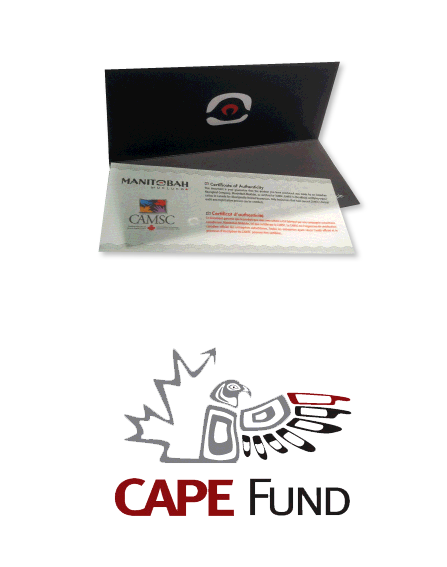 Every Manitobah product comes with a Certificate of Authenticity that outlines the role of Aboriginal companies within Canada’s economic landscape. It’s a reminder to each Manitobah customer that they have helped support a certified Aboriginal owned business. 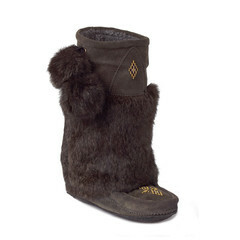 Now have a look at some of the mukluks that you can find at Aphrodite. We are in love with them! 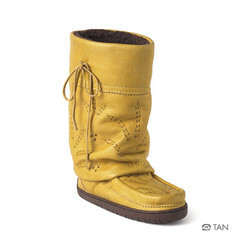 Prices range from $195 to $250.